The biggest problem I think every comic reader, or even person on the street (like Cash Cab style), has with the Superman mythology is that somehow not one person can see that Clark Kent is Superman. In Kent form, Superman simply puts on some glasses, wears his hair differently and stumbles around. I wore a Gumby costume to work this Halloween and everyone knew it was me (don't mind the date on this post...I have a time machine). The Daily Planet is filled with investigative reporters and nobody can tell Clark is Supes? The reason I mention this is because a section of Superman: Earth One focuses on the moment Clark Kent steps in front of the Daily Planet staff and they can't tell he is just the super being the watched take out an alien invasion. The scene is so blatant because the staff just saw the action and super hero up-close. Plus, when Clark steps in he claims to have been the first person to interview the hero (which no one had seen till that day) and now knows everything about him. His remarkable similarity in appearance to the flying, strength enhanced, wonder is just a minor coincidence. That scene killed me and made me understand why I never got into Superman comics long term. This of course comes right on the heals of reading Grant Morrison's All-Star Superman which made me wonder why I never got into Superman comics long term. Overall, the comic of the day wasn't bad; however, it didn't feel very original. Besides the use of the ship Superman came to Earth in, and the fact that he is sooo emo (like Tobey in Spider-Man 3), the story reads like a mix between Smallville turned comic and a Superboy tale. Plus, the art just seems ok. But, to be fair, I did read the book by way of printed copies of every page put together by way of a 3 hole punch and a couple of brads. Some of the pages had less ink than others. Oh, and the pages were in black and white. 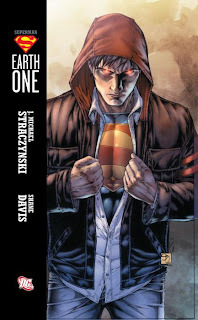 Like a judge at the Olympics, I would give this title a Superman: Earth Three as it's score. It's the first of the Ultimate Universe-like DC books and I feel I should give the upcoming participants room to be able to score higher in both difficulty and creativity. Here's hoping the next Earth One book sticks the landing a little better.